Biochemical reactions are necessary for growth, repairing damaged tissues and obtaining energy and take place in all living organisms’ bodies. These reactions are called ‘metabolism’ and happen continuously. If they stop working, it leads to the death of the organism. Metabolism is a group of biochemical processes that take place inside a cell. In these processes, complex and macromolecules are built from simple molecules. This is called anabolism. On the other hand, some molecules get broken down to extract chemical energy stored in them. This is called catabolism. Catabolism is the process of releasing energy stored in the chemical bonds present in the molecules, such as glucose. In the process of anabolism, simple molecules are used to build up more complex substances through a chain of reactions. These reactions consume energy, such as the synthesis of proteins from amino acids. All the reactions occurring in living organisms require high activation energy to take place. To reduce the cell’s consumption of energy, there should be a catalyst to ensure that the chemical reaction occurs rapidly throughout, reducing the activation energy. This catalyst is the enzymes. Enzymes are biological catalysts made up of large protein molecules. They speed up the chemical reactions inside the cell. The enzyme is made up of a combination of amino acids forming a chain or polypeptide between each other. Enzymes are similar to the other chemical catalysts. They participate in the reaction without getting affected. In other words, they speed up the chemical reactions inside the cells without getting consumed. Enzymes are affected by the hydrogen ion concentration (pH) and the temperature. Enzymes are much more specific than other catalysts. Each enzyme is specialized for one reactant substance. This reactant substance is called substrate, and it is specialized for one type of reaction or for a few reactions. Enzymes lower the activation energy required to get the reaction started. There are several factors that affect the speed of enzymes, such as the concentration of the enzyme, the concentration of the substrate, temperature, hydrogen ion concentration (pH), and the presence of inhibitors. The following is an illustration to show the effect of some of these factors on the speed of enzyme action. The protein nature of the enzymes makes them extremely sensitive to thermal changes. Enzyme activity is determined by a narrow range of temperatures compared to ordinary chemical reactions. Each enzyme has a certain temperature at which it is more active. This point is called the ‘optimal temperature’, which ranges between 37 to 40C°. The enzyme activity gradually lowers as the temperature rises more than the optimal temperature until it reaches a certain temperature at which the enzyme activity stops completely due to the change of its natural composition. On the other hand, if the temperature lowers below the optimal temperature, the enzyme activity also lowers until the enzyme reaches a minimum temperature at which the enzyme activity is the least. 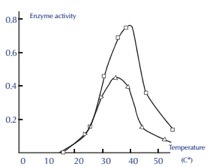 The enzyme activity stops completely at 0 C°, but if the temperature rises, the enzyme gets reactivated once more. Potential of hydrogen (pH) is the best measurement for determining the concentration of hydrogen ion H+ in the solution. It also determines whether the liquid is acidic, basic or neutral. Generally, all liquids with a pH below 7 are called acids, whereas the liquids with a pH above 7 are called bases or alkaline. Liquids with pH 7 are neutral and equal the acidity of pure water at 25°C. You can determine the pH of any solution using the pH indicator scale. Enzymes are protein substances. They contain acidic carboxylic groups (COOH), and basic amino groups (NH2). Enzymes are affected by the changing of pH value. Each enzyme has a pH value at which it works with maximum efficiency called the optimal pH. If the pH is lower or higher than the optimal pH, the enzyme activity decreases until it stops working. For example, pepsin works at a low pH, i.e, it is highly acidic, while trypsin works at a high pH. i.e, it is basic. Most enzymes work at neutral pH 7.4.